Back in April I posted “I Have a Cargo Bike” because Tim had been goading me into buying one. I felt I could load whatever I needed on the bikes that I have. 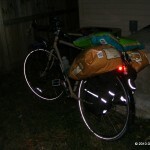 Earlier this month I brought home a 15lb bag of dog food on my ‘bent. I could barely tell it was there. I assumed a 30lb bag on the LHT would be fine. Today after work I went to Feeders Supply and bought the 30lb bag of dog food, and a 20lb bag of cat litter. 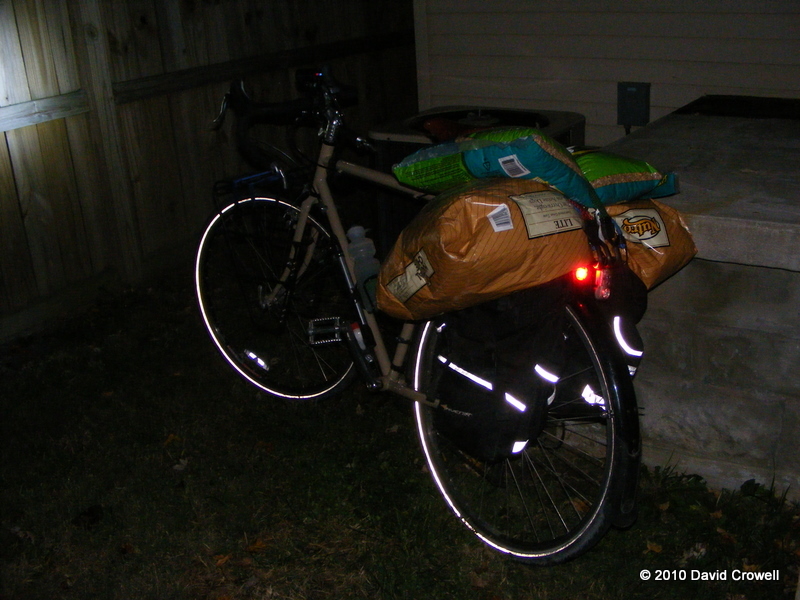 I put the food on the rear rack along with my other commuting gear. I put the litter on the front rack. I made it about 2 blocks. The bike shimmied and wobbled so bad I didn’t think it was prudent to continue. I moved the cat litter to the rear rack. So the rear rack was holding 70lbs of pet supplies, plus another 15lbs of other random crap. I don’t know what the capacity of the rack is, but nothing broke. The bike still shimmied, but it was controllable. I took it slow and easy and made it home. The picture to the right was taken outdoors, because I couldn’t get the bike up the stairs fully loaded like that. Brilliant! As much as my wife loves dogs, the “dog food hauler” might just be the door I’m looking for…thanks! Keep your eyes on Craig’s List. That’s where I found one of my kid trailers that I use for groceries and dog food. $50 for a kid trailer that will haul stuff is LOTS cheaper than a Big Dummy. The “$2000 dog food hauler” comment cracked me up. I like Tom’s idea, although I think I do understand the appeal of the Big Dummy. Hey, do you have a frame that could accommodate an Xtracycle? That might be a more affordable way to go. I really can’t justify another bike right now. I’m going to look around for a trailer. We can still talk about the old Burley trailer. And, yes, Xtracycles seem logical if you have something appropriate, which amazingly for me I don’t. Fisher is releasing an Xtra Cycle type bike called the transport. It is supposed to retail for around $1200. Maybe you can justify for $800 less than $2000.